It is a chilly autumn morning and Gwyn Haslock is dressed in a woolly hat and a snug waterproof jacket. With her board safely secured to her Peugeot 108, she is off to do her daily surf in Newquay. Not so unusual in these parts, you might think. But Gwyn is 71, a genuine silver surfer. 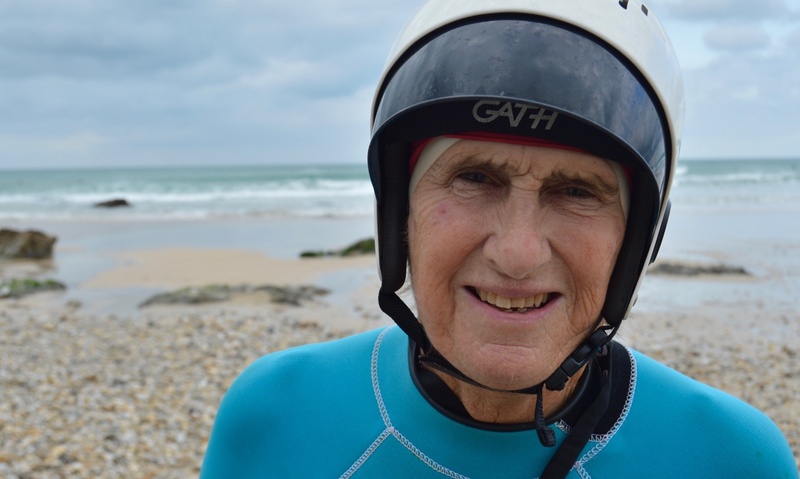 The pensioner, from Playing Place, near Truro, has the title ‘the UK’s first female surf champion’ under her belt and has carried on with her passion to this day. “If it’s something you love, it doesn’t matter what age [you are], whether you are nine, ten or 70 – just do it and do it within your limitations,” Gwyn says. It sounds like something you’d find in a self-help book or 100 Positive Quotes. She reminisces about how she got into surfing. She looks profoundly into the distance. Her memory may not be what it used to be, but she has clear recollections when it comes to surfing. She confides how her family used to visit Tolcarne Beach. She is still close to them; on the way back from Newquay she even picks up a phone-call from her brother Bob. It was natural for Gwyn to follow her brother into surfing. “I’ve always had encouragement from my whole family,” she enthuses. Her mother Mary didn’t like the water but Gwyn explains how she would always encourage her and others to go in the sea. Cornwall is one of the top places to surf in the UK. Thanks to its excellent geography and the fact it receives plenty of swell, both beginners and professionals enjoy the surf. Gwyn has these conditions right on her doorstep and considers herself to be very lucky. Determination is quietly reflected in Gwyn’s eyes. Someone once said she couldn’t go in the sea unless she could carry her surfboard. “I was determined to carry my surfboard so I just put it on my head,”’ she says. She highlights how the role of women in surfing has changed. “Now we have good professional women, who are surfing big waves as well as the men.” Carissa Moore, Malia Manuel and Stephanie Gilmore are possibly a few names she has in mind. The first surfing contest in Newquay was in 1966. It was held at Fistral Beach, Newquay, where Gwyn continues to surf. There was no separate entry for ladies, so the Cornish surfer took it upon herself to join in the competition with the men. She was the only lady entrant and was given a little pennant for competing. Consequently, Gwyn then received a letter from the British Surfing Association saying in the future they would run a ladies competition. For Gwyn it was the start of an impressive ‘career’ on the waves. “I suppose the highlight was winning the first British ladies championship,” she says modestly. She won many competitions in the UK but never took her surfing internationally. It seems like the ocean is more to Gwyn than just a place she can catch waves. It’s her playground. It’s her safe-haven. The same goes for surfing, it’s more than just something to keep her busy. It’s her passion. It’s her true love.